We look at the major talking points as England succumbed to a dramatic 16-15 defeat to New Zealand at a rain-drenched Twickenham on Saturday. Eddie Jones' charges raced into a 15-0 first half lead, but a try from Damian McKenzie and the boot of Beauden Barrett saw the visitors prosper by the slimmest of margins. New Zealand fought back from 15-0 down to record a narrow 16-15 win against England at Twickenham. For the second week in succession, there's only one place to start after a game-defining decision from the officials late on. Against South Africa last Saturday, the call fell England's way when Owen Farrell avoided a penalty for a no-arms tackle on Andre Esterhuizen. On Saturday, the decision went firmly against the home side. Four minutes left and with one point the margin of difference in favour of the All Blacks, replacement Courtney Lawes stuck up a big right paw to charge down a TJ Perenara box-kick. 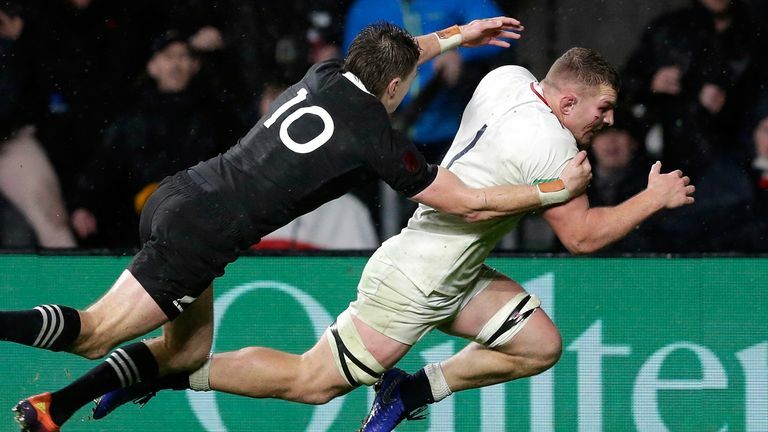 England openside Sam Underhill was first to react to the swirling ball, gathering it in, sprinting on and bamboozling Beauden Barrett en route to what looked like the match-winning try - a score which was awarded on the spot. Should Sam Underhill's disallowed try with four minutes left have stood? Just before Farrell could step up to convert however, French referee Jerome Garces got in touch with TMO Marius Jonker regarding a review - the first under the new directives introduced this weekend. Nothing was wrong with Underhill's finish, but was Lawes onside before he blocked down the ball? The decision was so tight that Garces could not adequately adjudicate it when watching on the big screens at Twickenham himself, while three minutes passed before Jonker eventually advised the on-field decision be overturned. 'Behind the hindmost foot' of the first player for the team in possession is where the offside line exists. Lawes' timing appears impeccable with regards to when Perenara plays the ball at the base of the ruck. Kiwi prop Ofa Tu'ungafasi kicks out his foot just before Lawes makes his move, but the England forward also appears to adjust his feet before travelling forward. An exceedingly tight decision. When looking deeply at the minutiae of the ruck, could Lawes be interpreted as fractionally offside? Perhaps. But could he also have been interpreted as onside? Yes. What it certainly was not, however, was clear and obvious - World Rugby's own stated consideration for Television Match Official referrals under the new global trials. Not even in the wildest imaginations of the most ardent England followers could they have expected a start as proficient as the one Jones' side made. Brodie Retallick spilled the kick off - which was indicative of the conditions - and after just two minutes, Chris Ashton struck for the game's opening try in the corner, after immensely abrasive carries from Kyle Sinckler, Maro Itoje and Underhill had generated forward momentum and quick ball centrally in the New Zealand 22. From there, Ben Youngs identified space out wide with Rieko Ioane sucked in and produced a stunning long looping left-hand pass to Ashton, who had enough pace to race forward and slide in past Damian McKenzie on the wet surface to cue a deafening chorus of wondered noise. Farrell was mightily unlucky to hit the post with the conversion from near the touchline, but England were unyielding in their appetite to run at New Zealand. To test them and rock them back. The men in white were ultra-aggressive and, unlike in recent Tests, superbly disciplined. The home side enjoyed, pretty much, a perfect first 38 minutes laden with immense physicality. Sinckler and Underhill continued to set the tone, with the flanker - making his first start in a year - smashing into McKenzie on five minutes and driving him into touch. Two minutes later, McKenzie was forced to carry the ball over his own tryline after Jonny May kicked on as the home side continued to build pressure. A scrum penalty against the head threatened to quell English momentum but at the very next set-piece, Codie Taylor overthrew at the lineout, after-which Farrell dropped a goal to increase the lead out to 8-0 after a Sinckler short ball created go-forward for the hard running Underhill. Just 24 minutes in and England were over for their second try via a fabulous maul which displayed fantastic inventiveness. Every player on the England team bar Elliot Daly and May joined the maul, which rode an initial All Black surge from the right, peeled off to the left and was an unstoppable rolling force from then on with skipper Dylan Hartley coming up with the ball. The score read 15-0 and the All Blacks appeared rattled heading into the final 10 minutes of the half as Aaron Smith kicked out on the full. Indeed, it's difficult to fathom how England would not score another point in the fixture. An Ardie Savea breakdown penalty would turn the tide for the closing stages of the half, but as starts go England can be mightily contented. So often the All Blacks are described as a barometer of where teams stand in the game and former Springbok Bryan Habana commented to Sky Sports at half-time: England's performance was "one of the most dominant first periods against the All Blacks" he could remember. While it is not unusual for sides in world rugby to reach a higher pitch of performance when opposite the All Blacks, particularly early on, England were tremendously impressive all the same. It's arguably the greatest 40 minutes England have put in under Jones - and certainly their best display for two years. But equally, the squad will know that irrespective of the late call going against them, they let a major opportunity to beat New Zealand slip by. The ebb and flow of sport is a curious thing. Last week, England went in at half-time 8-6 behind to South Africa but by far the happier of the teams after being completely outplayed by the Boks. On Saturday, they went in 15-10 ahead against the number one ranked side in the world and back-to-back World Cup champions, but undoubtedly would have been feeling worse than their counterparts after 10 All Black points in just two minutes. Both weeks the side that has been behind at the break would have been the happier, peculiarly enough. What this game illustrated again though, is that New Zealand know how to get the job done. They make mistakes, as all teams do, but when they really need to, they almost always strike through. They are utterly ruthless. When Savea earned a decision at the breakdown on 34 minutes, they gained territory and in the face of an immensely oppressive England defence, kept the ball for 23 phases before eking out a penalty for England not rolling away under the posts. The easy call for Kieran Read and co at this point, having struggled to make any inroads within the match up to then, would have been to take the points. But the All Blacks backed themselves and called for a scrum. In customary, and almost predictable fashion, they scored a try off it inside the final minute of the half as Ryan Crotty made great yards on the carry, and on advantage, Barrett played an inside ball for McKenzie to dive over. Outplayed, rattled, nowhere near their best and with time running out, they scored. And they struck in the Championship minutes - directly before the end of a half. The All Blacks almost always seem to profit in these moments. Farrell kicked the restart straight off, and with the clock in the red, New Zealand built up into the 22 again after a Jack Goodhue break off the scrum, and when England were caught offside, they notched three more points before the oranges. Scoring 10 points in the final two minutes of the half, New Zealand went from three scores down to within a score. Demoralising for England. A fillip of huge proportions for the visitors. England by contrast, let the game slip at such clutch moments. Farrell turned down two shots at goal after half-time at 15-13 ahead in the 48th and 49th minutes - the first saw a near identical maul formation to England's second try but it was cynically brought down as a host of All Blacks came in from the side. But New Zealand learn quickly and when Farrell turned down potential points for another lineout drive, the All Black maul defence was staunch and forced a Sinckler knock on. It was a big, big moment. And England's lineout malfunctioned and faltered badly with Hartley taken off at half-time. They lost five on their own throw - their most in a Test since November 2012 against South Africa at Twickenham - a match they also coincidentally lost 15-16. Last week, England won by a point, while on Saturday they lost by the same margin. The last time consecutive matches at Twickenham were decided by a single point? 1979. On the England side, the pack were outstanding in large swathes of the contest with Underhill, Sinckler, Courtney Lawes, Mark Wilson, Hartley and Itoje all illustrating what they are capable of in the physical stakes. Underhill is particularly worthy of appraisal after a display which had near enough everything, and could have been crowned off with a try. England's openside conundrum looks to be answered. Ben Youngs and Farrell showed glimpses of terrific control and awareness, while Ashton was always threatening. But more than anything else, England's lineout was a major contributor to their downfall. Jamie George will cop a lot of the criticism but unlike Malcolm Marx last week, he didn't overthrow the ball once. It therefore looked a combination of poor execution on the throw and lineout calling. On the All Black side, man of the match Brodie Retallick stood out again, as he stole three lineouts at pivotal moments, and carried and tackled to a standstill. Beauden Barrett, Ben Smith and Rieko Ioane were bright too and demonstrated their glorious abilities at times. Centre Sonny Bill Williams failed to impact the fixture and left injured, while scrum-half Aaron Smith and flanker Liam Squire both had poor games by their own standards.